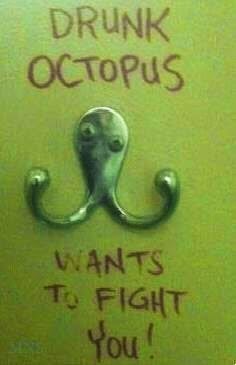 But DO I wanna fight Evil Octopus. Inside my head is an evil Octopus. Evil Octopus is inside my head. It has all its feet on the inside of my skull, and, it is pushing. There are 2 feet against my temples. Another 2 are behind my ears, the bony bit. 2 more are either side of my nose, just under my eyes. One foot threatens to come through the top of my head. And the other, through the back. I know it is an Evil Octopus because I am also leaking vast VAST quantities of mucus through the sole remaining open channel from the inside of my skull to the Outside World. My nose. Acknowledge the octopus, notice it, experience it. Embrace the octopus. Only then can you be free of it's embrace. I see the Octopus. It demanded my attention. I will not empower the Octopus. I shall not cling to the Octopus, I shall release the Octopus. :( hope you feel better soon. Evil Octopus doesn't stand a chance. To punch a fly. In the face.